Wired Campus shared an interesting story this morning about a career site for female science / engineering professionals. 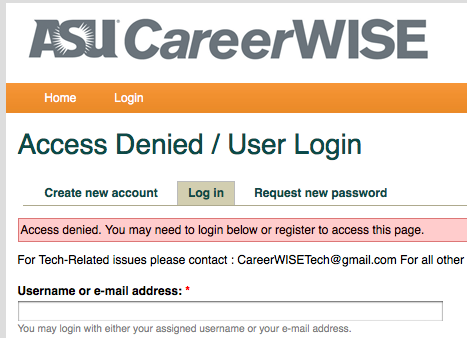 The site is called ASU CareerWISE and its mission is to help women with problem solving. I like the idea and I like that they built the site in Drupal, since I've become a big Drupal fan over the past year, but I think they've missed the point in a big way. You see, every link on the front page leads me to this: Now, I could be wrong, and I do understand the need for password protection in sensitive matters, but if I were looking for help with problem solving, and I clicked a link and hit a registration page, I would go somewhere else.